A P51D Mustang entitled "Red Tail Devil". 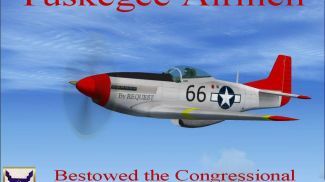 This is a historically accurate repaint of the P-51 Mustang flown by Colonel Benjamin O. Davis Jr., commander of the 332 Fighter Air group, which consisted of two bomber squadrons and the 99th and 100th fighter squadrons and better known as the Tuskegee Airmen or as the German's called them The Red Tail Devils. Enclosed is the complete aircraft file and historical documents of the Colonel's plane and fighter group. The group was recently bestowed the Congressional Gold Medal of Honor. By Mark Rooks. 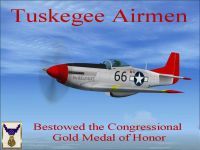 Screenshot of Tuskegee North American P-51 Mustang in flight. 2.Copy the "Red Tail Devil " folder and paste it in the main aircraft folder. "C:\Program Files\Microsoft Games\FSx\SIM Objects /Aircraft". Install Guages Folder In Guages Folder. Enjoy your new repaint and air file. The archive fsxred99.zip has 9 files and directories contained within it.